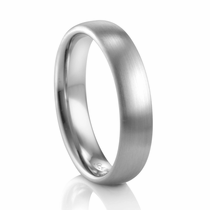 Mens Palladium Wedding Bands & Rings - 1/3 the Price of Platinum! From America's best ring band designers. 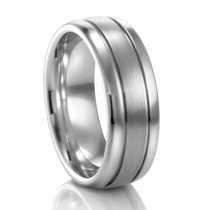 Palladium is a great choice for your wedding band. It's a natural silver-white colored precious metal. It's more rare than gold and even platinum. It's similar to platinum, but about 1/2 the price. You'll love the styles and appreciate the workmanship. You'll be purchasing a wedding band that has precious lasting value. PALLADIUM: Precious. Rare. A Great Choice. Palladium is similar to platinum - it's even in the platinum metals group family. It's a rare precious metal that is naturally white. 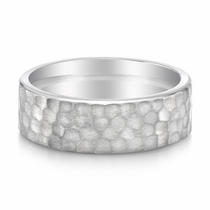 Palladium was first used in manufacturing rings and jewelry during World War II. It was a substitute for platinum. Platinum was a strategic war material and jewelers did not have access to it. Palladium rings will never "yellow" on you, like white gold rings do. White gold is made by taking pure yellow gold, and blending it with white metal alloys such as nickel. 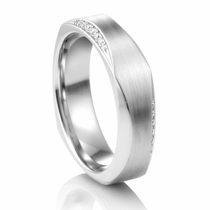 Then white gold is typically rhodium plated, which makes it nice and bright white. But the rhodium plating soon wears off and the result is a dull color that has yellow undertones. This will never happen with palladium. Are you allergic to nickel? Better stay away from white gold then. Palladium is hypo-allergenic and a great alternative. 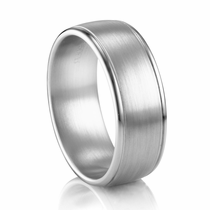 Palladium is also dense than platinum, so a palladium wedding band will not be heavy. 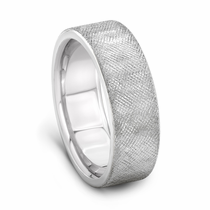 A palladium ring will weigh about 1/2 as much as a similar platinum ring. And less weight means less cost to you. 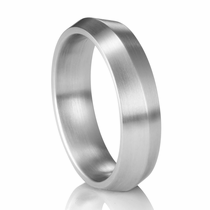 Additionally, palladium is much harder and less malleable than platinum, so your palladium ring won't bend or scratch like a platinum ring will. Want more info on this exciting rare metal? 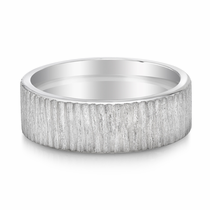 Read Why Choose A Palladium Ring? Customer rating for Palladium by Titanium Jewelry: 3 of 5 based on 4 customer reviews.